What Are the Differences Between a Doberman and a Rottweiler? They're both large, dominant dogs originating from Germany, but each was developed for a different purpose. The Rottweiler originated as a draft dog, pulling farmer's carts and also herding stock to market. The Doberman pinscher was the brainchild of tax collector Louis Dobermann, who began breeding the type of dog that bears his name for protection and companionship. The Dobie may have some Rottie blood in his lineage. The Doberman pinscher is somewhat taller than the Rottweiler, with males maturing between 26 and 28 inches at the shoulder and females reaching 24 to 26 inches. Although the breed standard doesn't specify a weight, most Dobies range between 66 to 88 pounds. The male Rottweiler stands between 24 and 27 inches, with females growing to 22 to 24 inches in height. Rottweilers, a more solid canine, weigh much more than Dobermans, with a range of 75 pounds up to as much as 135 pounds. The Dobie may appear in red, black, blue and a shade known as Isabella, or fawn, along with rust markings. The location of the Dobie's markings are similar to that of the Rottie, but appear on all feet and legs. The Rottweiler isn't usually a cuddly type, but he wants to make sure his people are safe. He can serve as a good family dog, but that doesn't mean he's fine with other people's kids. As a territorial canine, he's often not good with other dogs. On the plus side, he doesn't mind being alone as much as other breeds, so is less likely to suffer from separation anxiety. He'll certainly let you know if there's a stranger around, but he's not usually a nuisance barker. The Doberman pinscher wants to be with his people. He, too, makes a good family pet with the right socialization and training. He's more athletic and requires more exercise than the Rottie, and he's usually somewhat smarter. Without an outlet for that considerable energy, the Dobie can easily become destructive. 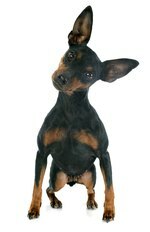 The Dobie is generally more affectionate than the Rottie and takes more easily to training. Neither breed is especially long-lived, with the Doberman pinscher usually living about 10 years and the Rottweiler between 8 and 10 years. von Willebrand's disease, a type of canine hemophilia. progressive retinal atrophy, which eventually causes blindness, and other eye conditions.